When you want to be edgy, you just have to get a bold piece like this. This Gold Punk Box Chain Multilayer Shoulder Chain Necklace is made of a gold plated box chain that wraps around your neck and falls over your shoulders. The necklace is further lengthened by several box chain that falls directly down the front. This piece is not for the faint of heart and can help those who want to look edgy achieve their unique style. it is made to be worn over your top or blouse or you can wear it with your bikini. Know someone who loves the edgy style? Do you love being edgy yourself? Then get this unique piece of chunky chain jewelry. 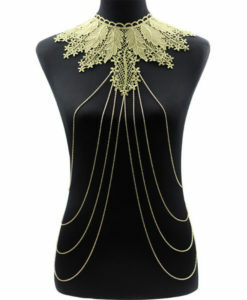 This Gold Punk Box Chain Multilayer Shoulder Chain Necklace will bring out the edginess you have been longing for.